Sunday, the 1st of May, I started and finished my first Marathon. The only thing I don't like about this race is the godawful early start. I know that the first weekend in May can be uncomfortably warm here and understand that an early start makes restricting traffic on CO-14 more feasible, but in order to eat and begin to digest an adequately sized blob of oatmeal before the 6:30am start I had to set my alarm for 3:30. 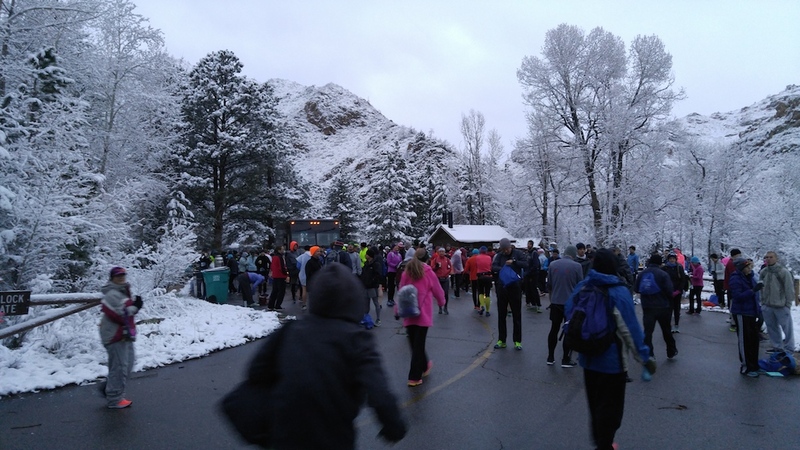 At 4:30 Ruth and I were headed to a parking garage downtown and at 5:00 we were on buses to the starting line. It was cloudy and dry downtown, but a little more wet in the canyon and about 14 miles up we reached the snow line. 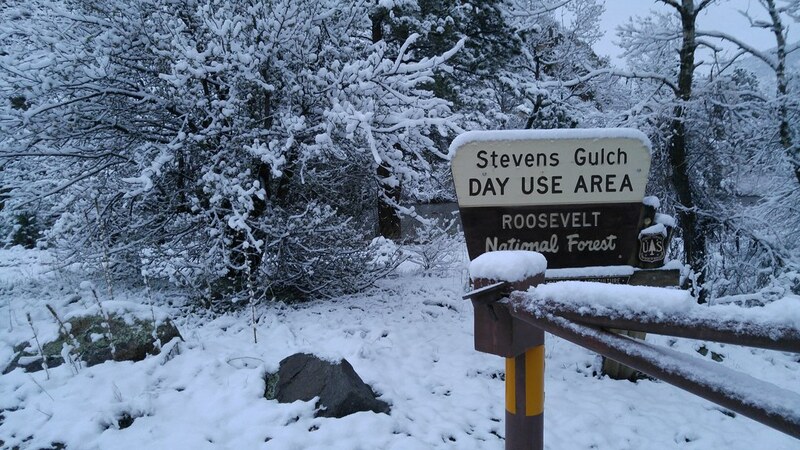 At the Stevens Gulch trailhead I saw about 4 inches of wet snow on unpaved surfaces. It was 34° F (1° C). At the last minute before leaving the house, I had switched to a long-sleeved shirt under my ultralight wind/rain jacket and was glad I had when we arrived. I'd already committed to wearing tights, hat, and light gloves and found this to be just about right for the conditions. A more breathable jacket would have been better: I ended up slightly wet from the inside due to condensation and fairly cold between finishing my gel packs at mile 16 and reaching "Bagel Hill" at mile 19. I had a hard time finishing. My hamstrings threatened to cramp up as I sped up on the last steeper downhill stretch around mile 12, but I survived that and was feeling pretty good until mile 18 when the quadricepds muscles in each of my legs began to cramp. I battled quad cramps of increasing frequency and duration the rest of the way in. The 3:45 flag that I'd been closing in on for an hour got away from me and the 4:00 flag passed me at about 20 miles. The final 6 miles were brutal: miles 20-23 were the worst, but once I crossed Taft Hill onto sections of the Poudre Trail I've run for almost 20 years, I regained enough confidence and energy and a sense of too-close-to-fail to put in a very modest kick at the end. My time was 4:24, which was just in the second half of all finishers. I don't understand the cause of the cramps, but can think of a few factors which might be implicated. The course, while never steep, descended much more than any of my training runs, about 300 meters. It wouldn't surprise me if I wasn't quite in the stride that I'd been training for. Also, while I'd run farther than 18 miles in training, I hadn't done so at race pace. I was confident that I'd be able to go a bit harder/longer than I had in training without breaking down, but found I could not. I'm going to train a little more for the next one. Lastly, the week before the race was super hectic. I was fighting fires all day long and sleeping poorly at night, and wasn't as rested as I'd hoped to be. Friends have been reminding me that it's super cool to finish my first marathon and I really appreciate this perspective: it was harder than I can expected and I'm satisfied to have been able to fight through a bit of adversity and finish. Ruth's race went better. She had just returned from a speaking tour on April 30 and briefly considered bailing on the half-marathon to catch up on sleep and nurse our ailing dog, but ended up running very well with a personal best time of 2:00:12.